Safe and Sound | the best is yet to come. My first full day in Hong Kong was a success. I am settling in well. I love in a dorm room at the City University of Hong Kong. 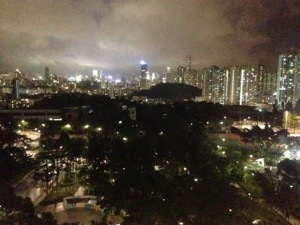 My room overlooks the downtown area of Hong Kong and it is stunning! My roommate is from Bali and she is lovely. After our long day today we bonded over our love of N’SYNC. Her internship is with Entertaining Asia and she hopes to work a wedding or a concert. Today I woke up around 7am even though my alarm was set for 8:15am. My roommate and I along with three other girls grabbed some breakfast around the corner from our dorms. I ate a spinach and mushroom quiche. I also drank a strawberry banana smoothie. At 10am we had orientation. All the students on this program had to get together to be told rules, etc. our program director also shared some internship tips. After our orientation a group of us went out to lunch at the Festival Walk which is the mall nearby. We got Korean food. I ate some clear rice noodles (i forgot the name) with chicken and a cup of seaweed soup with pork. It was very filling and quite delicious. Once we finished eating we decided to try our routes to work. I am an intern in the heart of downtown at the Legislative Council along with one other girl named Rachel from Canada. Together we took the MTR (the metro/subway system in HK) to our work. We had to transfer twice but it was a pretty fast trip. The MTR is extremely clean and crowded. When Rachel and I get off the MTR we exit the station and cross an overpass crosswalk. On the other side are the government buildings which includes the Legislative Council. It is really nice that we don’t need to walk that far because the heat and humidity is terrible here. At 8pm we had another meeting but it wasn’t mandatory. It was a get to know your fellow students/interns thing. The program directors had ice cream for us at the meeting which was a nice incentive for us to go. Although the ice cream was much different than what i am used to in the states. It was mote like a fruit popsicle. 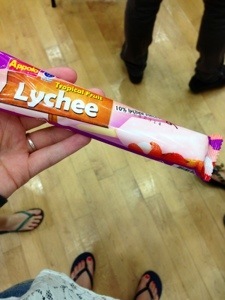 The flavors were durian, coconut, and lycée. Since I missed the welcome dinner last night I was eager to go and meet people. I ended up talking with Kim one of the program directors as well as three other girls. Apparently the highest bungee jump from a skyscraper is in Macau and we talked about that a bit. Some people want to go. I think I’ll pass. I’d rather take the tram to Victorias Peak. I’m not a huge adrenaline junkie. I know if my boyfriend were here he would totally want to do the bungee jump thing! Now I am about to fall asleep so I am well rested for tomorrow. I don’t work tomorrow because Dream Careers wants us to get more accustom to the time change. I appreciate that a lot because a 12 hour time difference isn’t easy to get used to. Tomorrow morning I’m going to practice going to work again during rush hour with Rachel. Wish us luck! Peace and love from around the world.